A ladder provides a safe alternative to encourage your cat's natural tendency to climb and helps direct cats to the spots you want them instead of your counters and tables. Help your feline friend get around by making a cat ladder. The ladder reduces the chance of an aging or weak cat getting hurt or knocking things over when jumping. A ladder for a cat should be solid between steps to prevent falls, in comparison to a ladder for humans, which has open spaces between the rungs to accommodate human hands and feet. Hold the protractor at the top of the item your cat's ladder will reach up to and make sure the angle going down to the floor is no steeper than 45 degrees. Visually mark the spot on the floor where the angled line will touch the floor and put the penny on that spot. Measure the area where you plan to put the cat ladder, starting at the penny and measuring up to the top where you originally held the protractor. Add 2 inches to the length. Measure the 2-by-4 board's length and use the pencil to mark the desired length of the ladder. Put on the safety goggles and use the saw to cut off the excess board, keeping the hand holding the board hand out of the way of the saw's blade. Place the plywood squares on the board and visually position them so they look even. The gaps between the squares should be 4 to 5 inches long. Use the pencil to mark the edge of each square where it touches the 2-by-4 board. Put a drop of glue about the size of a quarter in the center of each square and press the squares onto the 2-by-4 board. Use the screwdriver to set three screws in each square, about 2 inches apart in the shape of a triangle. Make sure the screws go through the plywood and into the 2-by-4 board. Sand off any rough spots or splinters you see or feel on the ladder by rubbing the sandpaper against the cut edges of the boards. Position the cat's new ladder in the spot you measured. There should be 2 inches sticking up at the top, slightly overlaying the top edge of the item the cat will be climbing. Anchor the ladder with the anchor screws by drilling through the top edge of the ladder and into the item you are attaching the ladder to, or use the duct tape to secure the ladder if you do not want to set the anchor screws in the item. Failure to anchor the ladder can cause the ladder to tip, creating the potential for injury to your cat and anyone standing near or under the ladder. 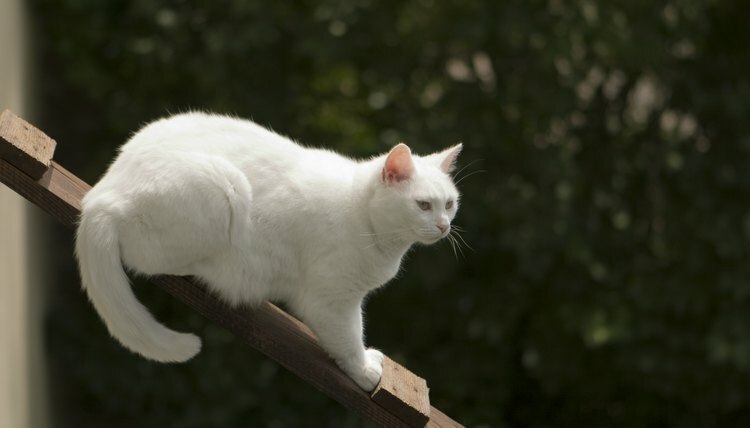 You can decorate your cat's ladder with paint to match your room's decor or stain it for outdoor use. The ladder's length can be adjusted according to the space you have available by increasing or decreasing both the length of the 2-by-4 board and the number of squares used. Consider carpeting the squares with adhesive backed carpet sections to give your cat something to grip when climbing.